Last Thursday, I suffered a BIOS flash problem on my primary test machine that resulted in a completely dead motherboard: no post, no action at startup except for lights and fan up, followed by an immediate shutdown. A little research showed that my Asus P5K is one of a very few modern motherboards that can be reduced to inert circuitry by a BIOS flash error. A quick $20 to a chip supplier on ebay got a new chip on its way to me in the mail, but I had to have another machine to mess about upon as soon as possible. 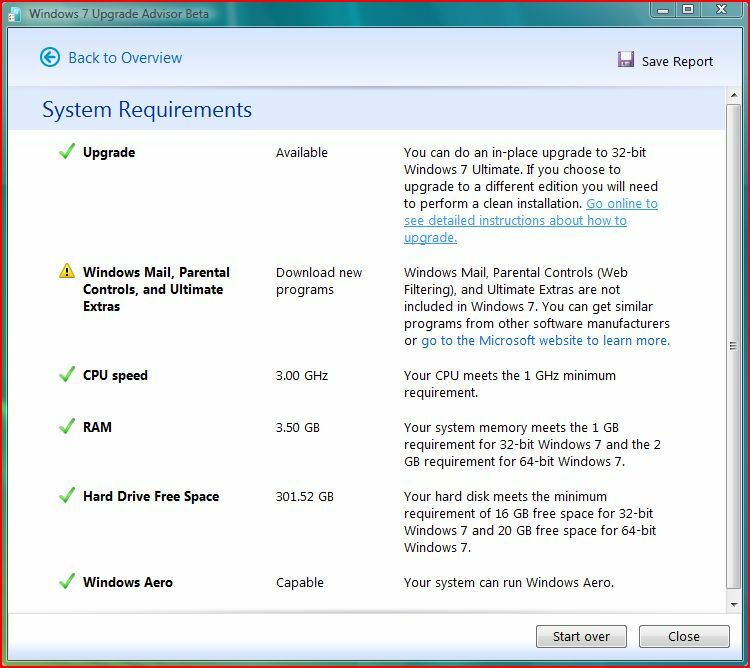 I decided to resuscitate my previously moribund Windows Vista Media Center PC, which includes a Gigabyte X38-DQ6 mobo, a QX98650 quad core CPU, a GeForce 8800 GT, 4 GB DDR2-800 RAM, and about 1 TB of putative disk storage. In short: a state-of-the-art PC in 2007 when it was put together, and a decent system even by today’s standards. Altogether, this process took a long day to complete (though I kept working on other stuff on my production machine all along, so it didn’t keep me from taking care of my more usual business). 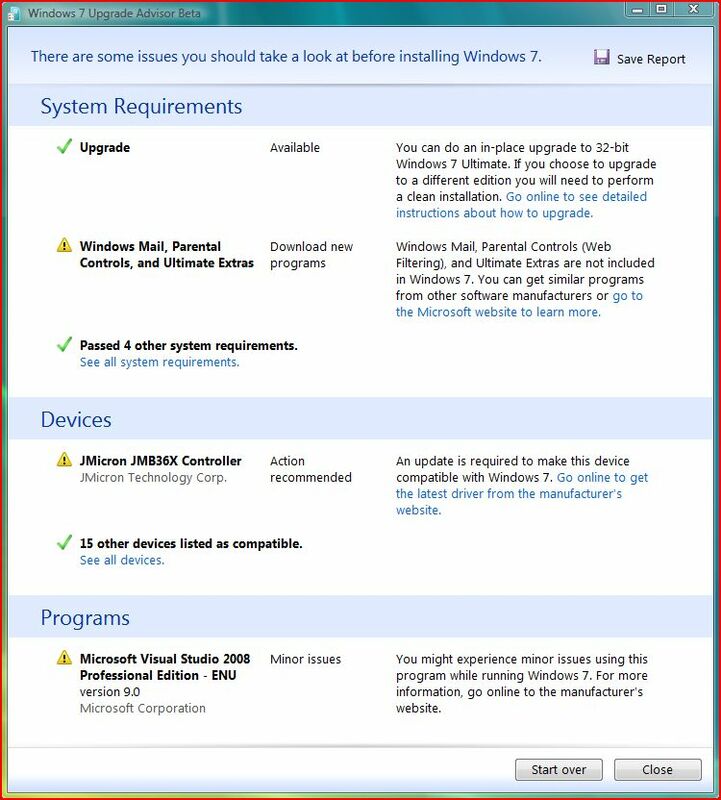 Over the weekend, I got started on the upgrade process, kicking things off with the still-beta version of the Windows 7 Upgrade Advisor (I can’t find a newer version of this available just yet, so I guess MS doesn’t feel itself on the hook to deliver same until the official GA date for Windows 7 rolls around on 10/22/09). When I ran the program via a remote desktop connection it fired off without a hitch, but proceeded to grind away for 25 minutes, before I gave up and tried again at the machine’s local controls. This time, it finished in a mere 3:25 before tendering its compatibility analysis. Based on my earlier failed venture I expected to see some programs in need of removal, and wasn’t sure if all the hardware on this system would pass muster. After it identified my JMicron JMB26X RAID controller driver as a potential sticking point, I visited the vendor’s FTP site and downloaded then updated the 1.17.32.6 driver to the latest WHQL 1.17.49.4 drivers instead. After that I re-ran the Upgrade Advisor to produce the following screens (which still didn’t do away with the JMicron JMB36X warnings, even though my production system is running Windows 7 quite happily with the 1.17.31.0 drivers, and what I have on the test machine is much newer). Here’s a shot of the devices page from the UA, with the warning about the JMB36X controller featured prominently at its head. It’s a real relief when everything — or as in this case, nearly everything — comes up with a clean bill of health, hardware-wise. 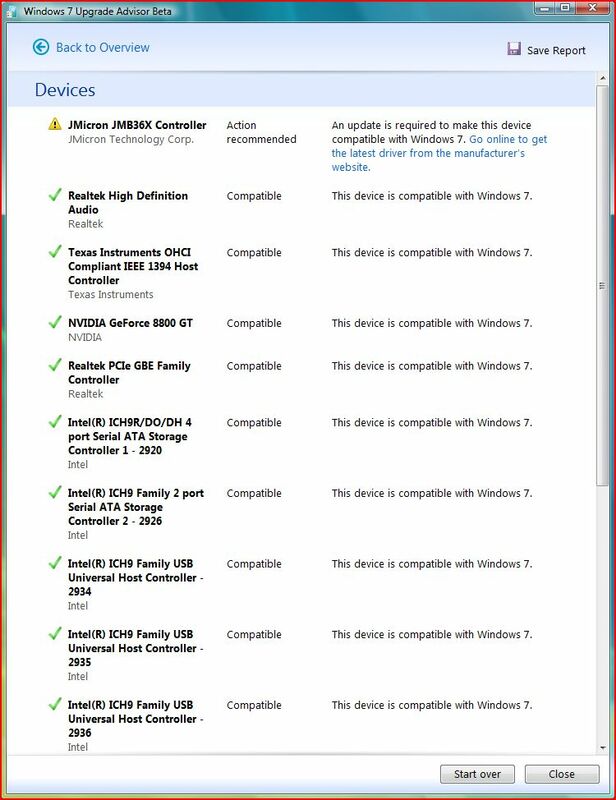 Given that my other machine includes the same RAID controller and is working famously with Windows 7 on an older version right now, I’m not too concerned anyway. I’m reading reasonably reliable reports that this motherboard works with all four DIMM slots occupied (my earlier P35 models couldn’t handle all four slots filled) so I’m also going to install 64-bit and try 12 (2×4 plus 2×2 GB) and 16 (4×4 GB) RAM in this rig as well. But let’s save that for another day. There’s also a minor warning about the version of Visual Studio I have installed on this machine, but I’ll cross that bridge when I next turn to those tools on that machine (count on me to report back if anything untoward presents during that process). Frankly, I’m not too worried about it. My only beef with the driver warning from the UA is that it gave me no idea which version I should use instead, and I gave up after trying the three most recent versions on the vendor’s FTP page and still not getting it right. At this point, I’m ready to run the upgrade install. I’ll report on my experiences in performing that upgrade in my next blog, the day after tomorrow (August 19).